Paddling would mar wild landscapes | Keeping Wilderness WILD! Thanks for this thought-provoking post. I really appreciate your many efforts to protect wilderness areas, but am confused about how opening waterways to paddling and rowing would damage the wilderness nature of these areas. I am writing both as a several-year member of Wilderness Watch and a whitewater kayaker and canoeist from Fairbanks, Alaska, where I have the enormous benefit of access to many wilderness rivers. I don’t understand how these bills would grant “this single user group access” to waterways. Hikers can access the waterways, and it seems like they are the only “special-interest” group with special access to the waterways under current regulations. You speak against both overriding resource professionals with legislation, as well as against paddlers and rowers being able to use the waterways. Frankly, I can understand and appreciate your objection to using legislation that way, as well as the diversion of resources to studying its feasibility. But I don’t understand your objection to boats on these waterways. Iconic vistas are no longer wild and untouched by the site of bright and multicolored tents in a wilderness. How is that any different from seeing a boat on a wilderness river? Tents are just as much fluorescent technology as boats are. Although I grant you that modern boats are built with materials unlike anything found in primitive America, the basic shapes are the same as canoes and perhaps kayaks that I suspect were used in more primitive times on at least some of the waterways covered by the legislation. Just like the hiking boots, clothing, tents, and stoves used in backcountry today use modern technology. 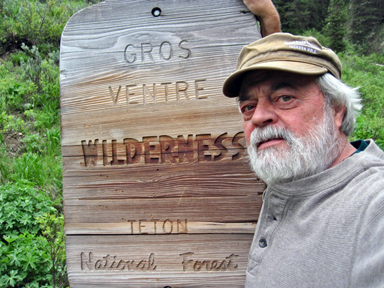 With each rereading of your post, I can’t help but think that perhaps the logical conclusion is that we should exclude all people and all human activities from wilderness areas, since hikers are also a special interest group that use wilderness as “pleasuring grounds for a select group of adventure seekers” who use fluorescent technologies. If you have a moment, I’d appreciate your help in understanding these issues better. The more I learn about wilderness issues, the more complex the issues seem to become. Thank you for your remarks regarding the pack rafting legislation currently making its way through Congress. You raise very good questions, and I will do my best to describe why I remain opposed to this particular legislation. First, some background: The pending legislation- “Yellowstone and Grand Teton Paddling Act” (HB974) is just that, an act that would open for recreational floating many of the rivers and streams in just these two national parks. The legislation addresses no other parks or wilderness areas in the nation. As a side note, neither park has any officially designated wilderness areas. Grand Teton has identified 49% of its land either as “Recommended”, “Potential” or “Eligible” for wilderness designation and claims to “manage the lands as wilderness” while Yellowstone “manages as wilderness” over 95 percent of its land. (Interestingly, 56 percent of all our nation’s National Park lands are officially designated wilderness areas.) Wilderness Watch has concerns about “managed as wilderness” because chain saws and helicopters are all too often used within the “wilderness” lands of both National Parks. Yellowstone and Grand Teton National Parks form the ecological heart of the approximately 20 million acre Greater Yellowstone Ecosystem. They are arguably the most protected portion of the ecosystem yet make up less than thirteen percent of the ecosystem’s total landmass. Yellowstone allows boating (non-motorized) on only a one-mile river channel between two lakes, while 163 of its 168 lakes are open to boating- most are restricted to non-motorized watercraft. In Grand Teton, most of its lakes are open to boating, a few to motorized while most for non-motorized watercraft only. The 26-mile stretch of the Snake River flowing through Grand Teton hosts approximately 60,000 floaters each year- both commercial and private. But more significantly, thousands of miles of extraordinary whitewater and scenic paddling opportunities exist in the rivers and streams within the 17 million-plus acres of public lands surrounding the parks. Continuing the prohibition on floating the park’s rivers and streams will not prevent floating enthusiasts from experiencing countless other scenic and white water adventures in the Yellowstone region. The parks’ waterways can be divided into three general categories; first, those in the remote backcountry that require significant, human or horse powered effort to access (primarily for pack rafting). Second, we have the world-class white water opportunities available particularly in the canyon sections of the Yellowstone and Lewis Rivers (primarily for kayaking). These are relatively large rivers, stretches of which are fairly close to paved roads and easily to moderately accessible. And third, the front country rivers and streams that are so accessible that they can be floated by anyone with an inner tube, raft or kayak. The manner in which the current bill is written and the way that NEPA works, it is likely all of the parks’ waterways would have to be analyzed for all non-motorized recreational floating. Backcountry floaters would add a new dimension to the already existing backcountry use. The remote waterways in both parks are the life-blood for habitats that are home to many sensitive species. For some like the wolverine, grizzly bear, and wolf, these lands provide core refugium- the last of only a few large landscapes remaining in the lower 48 states where these iconic wildland species can play out their lives relatively free of human disturbance. Also, most of the streams in question are narrow and paddlers would temporarily displace everything occurring between their banks- including sensitive species like the harlequin duck. The whitewater experience provided by the Yellowstone and Lewis River Canyons would draw hundreds if not thousands of kayakers annually. This is the “adrenalin” portion of the debate. New access and take out points would likely have to be constructed. Ranger staff would have to be put in place to manage the activity, and search and rescue teams might have to be expanded. Not to mention the impact whitewater activity would have on the wildlife in the canyons. And a factor not given enough attention is the number of spectators that would amass to view the canyon kayakers. Traffic and visitor management could become a considerable problem at some locations. If kayaking were allowed, Yellowstone risks becoming a world-class, high adventure , recreational park that would require significant management to keep resource damage to a minimum. Whitewater kayaking could become a park attraction in and of itself. I fear that for too many participants, the white water action would greatly overshadow the real purpose of a national park. And if park visitors who stopped to watch the whitewater action were asked what was the most memorable part of their trip, they might say, “watching the kayakers in the canyons.” Forgotten would be the wonder of seeing first hand how western America was when witnessed by the likes of Lewis and Clark more then two centuries ago. For too many visitors and floaters alike, Yellowstone would be seen as a place of great recreation adventure, not a place where wildlife can be observed interacting on their native landscape as they have for millennia- one of the primary drivers behind the National Park idea and the creation of Yellowstone as our Nation’s- the world’s first national Park. I cannot imagine this in Yellowstone or Grand Teton or how this too would change the experience of the park’s non-floating visitors if this were to be replicated on the Madison, Firehole, Lamar or other streams within the two parks. And I cannot imagine how this would impact osprey, bald eagle, Canada geese and trumpeter swan nesting success, let alone how it would impact river otters, beavers and kingfisher, water ouzel and great blue heron activity along these streams. Instead of viewing abundant wildlife as visitors now do, they would be greeted by scenes of colorfully adorned recreational floaters. I do think that seeing brightly colored rafts on our waterways would be a distraction to the millions of road-bound visitors. Reality says that most visitors view national parks through their windshields or from a few yards off the pavement. If park visitors take home images of recreationists tubing and rafting on the waterways, then their idea of our National Parks and wild lands may not translate into the type of long-term protections these special places require. The Greater Yellowstone Ecosystem is correctly referred to as the largest, mostly intact temperate ecosystem on the continent- but that being said, it is not large. It is essentially an island surrounded by developed and agricultural lands. Yet this island-ark ecosystem remains home to nearly all the species native to the region when white man first entered the scene. It is also a region facing intense development pressure with one of the highest population growth rates in the country. Authorizing more human use in more places will only add to the stress our wildlife populations already face on a daily basis. I may be wrong here, but I suspect your point of reference might be Alaska. Northwestern Wyoming is not like Alaska where the amount of wild land far, far exceeds what we have in the relatively isolated ecological island called the Greater Yellowstone. Our parks are far more accessible and I dare say, accessed by far greater numbers of people than most areas of Alaska. Just by the numbers, Denali National Park with over 6 million acres receives on average just under half a million visitors annually (average for the past 5 years). By comparison, Yellowstone and Grand Teton each welcome about three million visitors annually. Therefore, Denali has about one visitor for every 13.6 acres of land, whereas Yellowstone and Grand Teton have one visitor for every 0.4 acres. Although I don’t have estimates on the population density of wildlife in both park regions, I dare say our environment has as many or more large animals per land area then Denali- or most of Alaska for that matter. My point is that for every visitor in Yellowstone and Grand Teton, there is a far greater prospect of contact with, and perhaps impact to wildlife then in most other regions of the country, including Alaska. Consequently, I believe that a less-visited backcountry and less disturbance within our waterways becomes even more important for the wellbeing of our wildlife. Many would argue that we can have both- more recreation and still protect the wild integrity of the parks. I’m not sure we can have both. How many times can we diminish something by a percentage point or two and still have a functioning whole? Particularly when the whole is finite and as relatively isolated as the Greater Yellowstone Ecosystem. How many times can we diminish even by a fraction the system’s core wildlife sanctuaries- Yellowstone and Grand Teton National Parks and still retain their ecological function, and respect for their mission- “which purpose is to conserve the scenery and the natural and historic objects and the wild life therein and to provide for the enjoyment of the same in such manner and by such means as will leave them unimpaired for the enjoyment of future generations[.]”? There are abundant opportunities for pack rafting and kayaking in the region, so lets leave the few waterways in Yellowstone, our first National Park and its neighbor, Grand Teton free of one more recreational activity. We have many other means and locations to enjoy outdoor adventure, but our wildlife has very few places remaining in which to thrive. If we cannot protect our National Parks, what is there left to protect?